The Greenwich High School boys and girls skiing teams have each made their mark in their respective races so far this season. 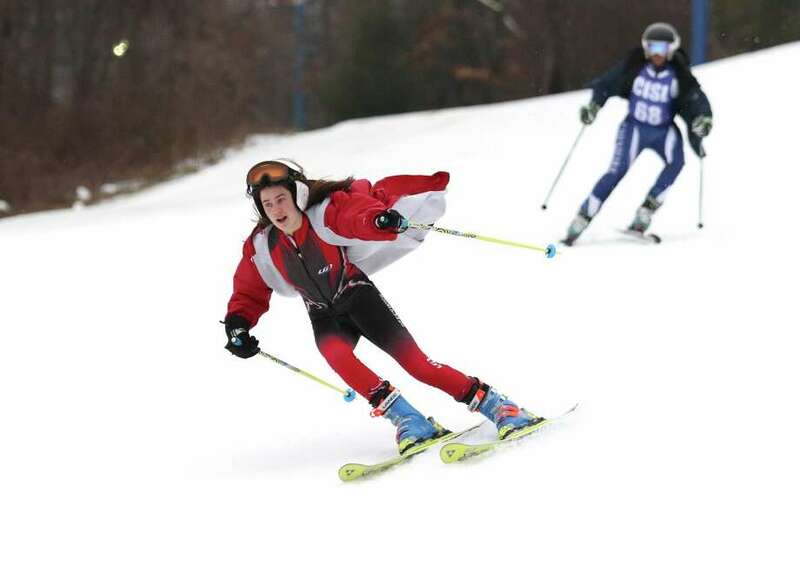 A busy skiing week ended with more impressive finishes and fast times for the Greenwich High School boys and girls ski teams — a pattern the Cardinals began from the season’s start. Due to postponements earlier in the season, races were held Tuesday to Thursday at Mount Southington this week and though a bit weary, the Cardinals rose to the challenge each day. The brother and sister duo of Christian and Sophia Bastek have helped guide the boys and girls teams, respectively. A senior, Christian Bastek is a two-year team captain, who is in the midst of his four successful season on the squad. Sophia Bastek is a sophomore, has made her mark since she joined the team as a freshman last winter. When they’re not with their Greenwich team, both hone their skills at Stratton Mountain in Vermont. Their sister Gabi, a 2017 GHS graduate, was also a standout skier. On Tuesday, Sophia Bastek won the girls’ alpine race at Mount Southington, finishing her two runs in a combined time of 46.03 seconds. She clocked in at 22.29 in her first run and posted a time of 23.74 seconds in her second. Christian Bastek registered a fifth-place time of 45.84 in the boys’ race (23.27, 22.57). The Cardinals’ boys squad finished first in team standings on Tuesday, recording a total team time of 285.98 seconds. Staples placed second (288.3), followed by Wilton (288.75) in the race, which included 10 teams. Sophomore Matt Sisca had the GHS boys’ next best finish in Tuesday’s race, placing ninth with a time of 46.36 (23.53, 22.83). Matthew Jester finished 15th (47.43), while Robert Donnellan was 17th for Greenwich (47.7), which was also represented by Christopher Tella (48.58), Hunter Gruenstrass (50.07), William Clemens (50.26) and Thomas Schwartz (51.41) at Tuesday’s race. On the girls’ side, senior captain Tori Glaser took 17th in 49.56 (24.14, 25.42), while Eleanor Ybarra was 21st (51.22). Senior Sloane Loveless, who is in her second season as one of the captains, finished 28th overall (52.13) in Tuesday’s race, followed by Caitlyn Home (54.08) and Nicole Walko (54.64). The Greenwich girls finished fifth in the team standings in Tuesday’s meet with a time of 307.66 seconds. Christian Bastek had a seventh-place finish in Wednesday’s race at Mount Southington, clocking in at 46.89 (23.97, 22.92). Donnellan was 12th (47.89) and Tella was 17th (48.47) in the alpine race, which was won by Jose Riera of Brunswick School (45.01). The Cards (298.88) finished third out of nine teams, placing behind Ridgefield, Wilton and Fairfield Prep. In the girls’ race, Sophia Bastek posted a second-place for Greenwich with a time of 48.7 seconds (23.90, 24.80). Mary Foley of Amity took top honors (48.41), while Glaser finished 12th for the Cardinals and Ybarra (55.17) and Loveless had top-20 finishes. Greenwich was second in the team standings (10 squads) behind Ridgefield. In the Cardinals’ meet on Thursday at Mount Southington, Sisca placed third in 47.45 (24.50, 22.95). Christian Bastek was fourth on Thursday (47.62) for Greenwich (295.96), which finished just behind Southington (295.96) among the 13 teams that competed. Donnellan finished 12th in the race (49.28). Sophia Bastek turned in a second-place showing in the girls’ race, notching a time of 47.85. Weston’s Lauren Harris won the race (47.72). Christian and Sophia Bastek and Sisca each qualified for the New England Championships by excelling at the giant slalom and slalom shoot-outs, recently. With the regular season winding down, the Cardinals are preparing for the CISL State Championships, which takes place early next month. Greenwich’s boys team won the state title in 2014 and 2015.